You’re not going to be able to see all of South America in two weeks – but we’ve got everything you need to plan your travels with our pick of two week South America Itineraries. Inspiration for your next Latin American adventure. Going to South America? 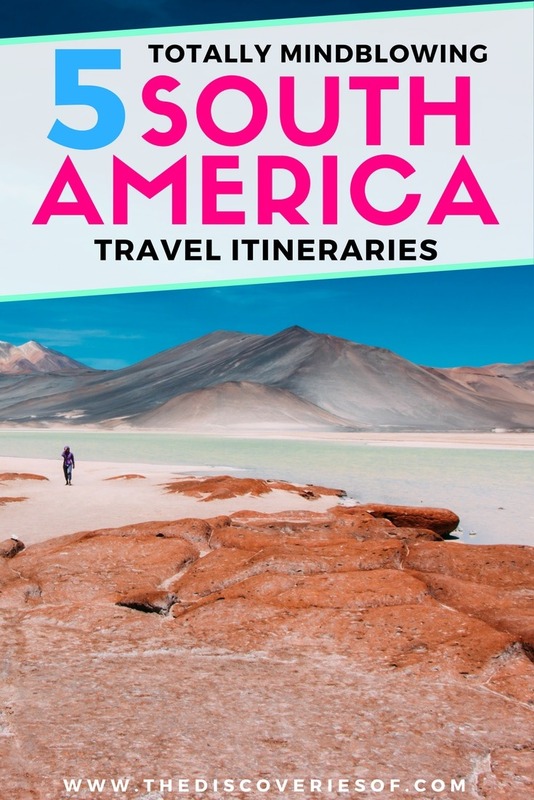 Read my step-by-step South America guide. Everything you need to know to plan your trip. South America is such a large continent that it can be difficult to know where to start and how much to see on a shorter trip. Into beaches, jungle or mind blowing landscapes? Whichever way, there’s an itinerary for you. Patagonia is tucked away in the southernmost area of South America. Its vast landscapes and barren seascapes are like something out of your imagination. Except this is definitely real life and you can go there. Once, Patagonia was only inhabited by glaciers and wildlife – something that’s difficult to forget when you look out at empty sceneries and wide-open views. You could reasonably spend a lot longer in Patagonia but we’ve created the perfect Patagonia 2 week itinerary to showcase the region’s highlights. Your two weeks in Patagonia begins in the small but thriving backpacking town of El Chaltén, Argentina. This tiny hamlet has expanded over recent years and now boasts some good hotels and cool restaurants and bars. Travel to El Chalten and recover from your journey: you’ll need your energy for tomorrow. Suggested stay: Don Los Cerros Boutique Hotel & Spa. 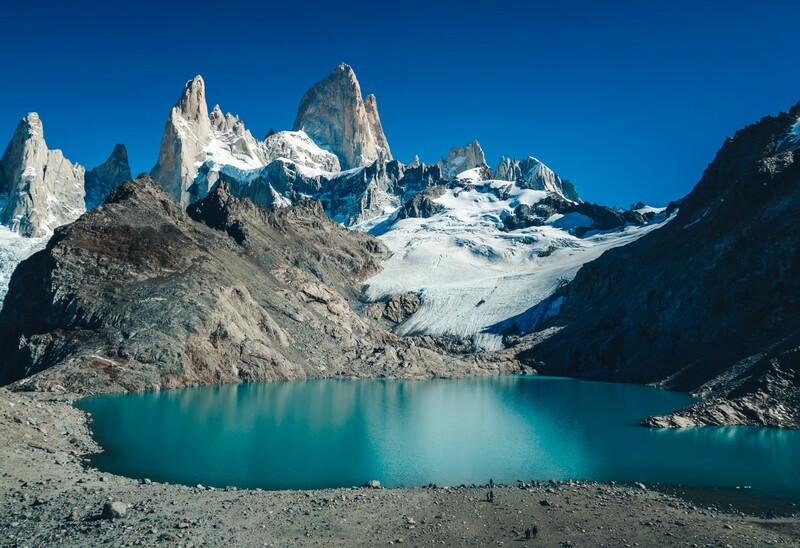 Head on a two-day trip to Mount Fitz Roy, which takes about 4 hours hiking each way, setting camp at Campamento Poincenot overnight. After your camp, you’ll head back to El Chaltén for another night before you move on. Transfer to Lago Argentino, partly via Ruta 40, Argentina’s most famous highway. Once there, keeping driving to the Lago Roca campsite (in the Parque Nacional Glaciares) on Route 15 for the night. 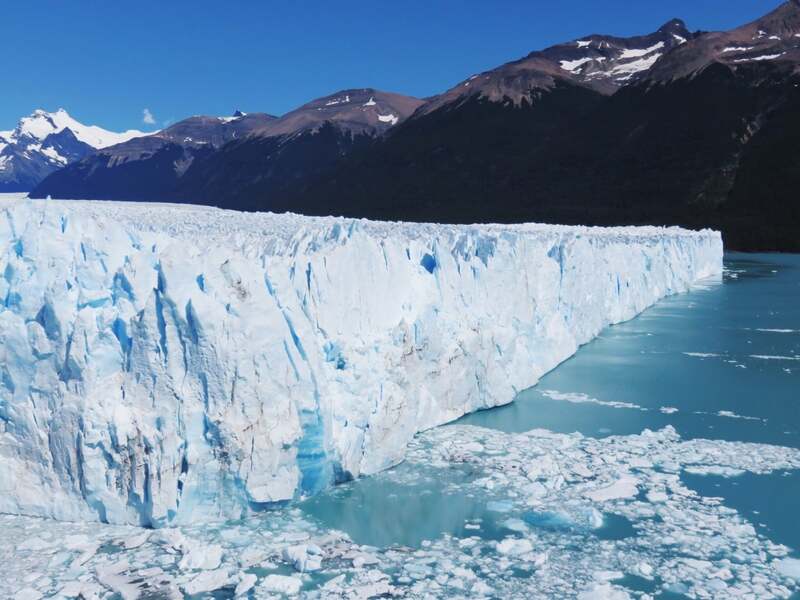 The next day you will then hike to the breathtaking Perito Moreno Glacier, one of the most beautiful glaciers in the world, before heading to Puerto Bandera for a boat ride to the glacier’s edge. 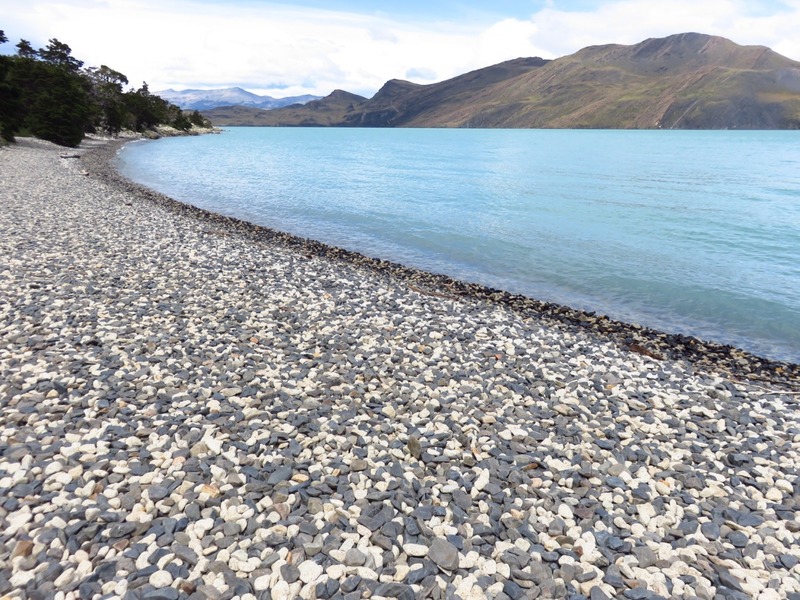 Take a road trip to El Calafate, 51km east of Puerto Bandera. El Calafate is well connected – making it the perfect overnight stop. The town also has a range of accommodation, from luxury hotels such as Esplendor El Calafate, to more budget hostels and campsites depending on your budget (Hostel America Del Sur is a fabulous choice and puts on an incredible Asado feast once every few days). While you’re in town, take some time to walk out to the spectacular Reserva Natural Laguna Nimez – it’s a great place for spotting flamingos and other birdlife. Take a minibus across to the Chile border at Rio Turbio and stop in the lively port city of Puerto Natales, where you will stay overnight. Hostel-wise The Singing Lamb gets our vote – if you’re looking for something a little more upmarket, go to Hotel Indigo. There’s not a huge amount to do in Puerto Natales – it’s a relatively quiet city with a nice atmosphere. If you get there early enough, the talk at Erratic Rock about the W Trek is worSumoth attending. Otherwise, attractions such as the Municipal Historical Museum lie in the city, which display artefacts from the region’s indigenous population. Take a transfer to Torres del Paine National Park, where you will then take on the 5 day hike on the W Circuit. 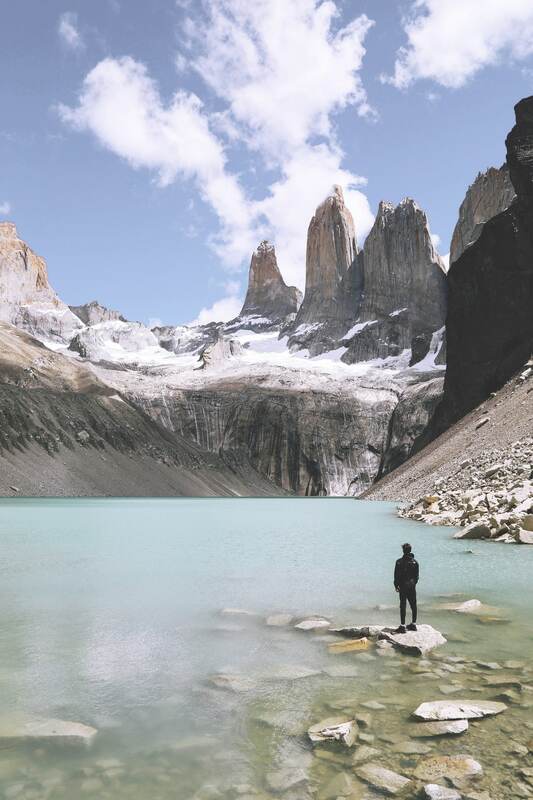 The hike is often quoted as one of South America’s best, thanks to a range of mountain, glacier and lake views, ending with the spectacular Torres del Paine themselves. If you have a little more than two weeks in South America, you can do the 8-day O Trek, which extends the route to a quieter section of the park. You can camp or book the basic but pleasant refugios on the W Trek, if you opt for the O, you’ll have to camp. Either way, you’ll want to check out this Torres del Paine packing list. On the last day of your two weeks in Patagonia, head back to El Calafate to have a rest and perhaps a night in a luxury hotel to unwind and relax (with some steak, of course) before going back to reality. Our second itinerary for two weeks in South America takes you through the inner parts of the Incan Empire, witnessing the relics of the Quechua and Aymara nations of Bolivia and Peru. This route not only gives you an insight into the culture of the Incan peoples, but also some incredible landscapes including Machu Picchu and Lake Titicaca, neither of which should be missed. Arrive in La Paz, your base for the next 2 nights. La Paz sits on top of the Andes’ Altiplano plateau, more than 3,500m above sea level, and boasts the Mount Illimani as its dramatic backdrop. It is also home to the world’s longest and highest cable car system, named the ‘Subway in the Sky’. With fabulous local cuisine, Andean music, and a range of accommodation, La Paz is a great place to stop before you begin your big adventure. Take a bus trip to Lake Titicaca, which passes through Copacabana, a lakeside resort where you will stay for the night. Take a day trip out on the lake, which also happens to be the highest navigable body of water recorded on Earth, to the Isla del Sol, which inhabits many pre-Columbian ruins. 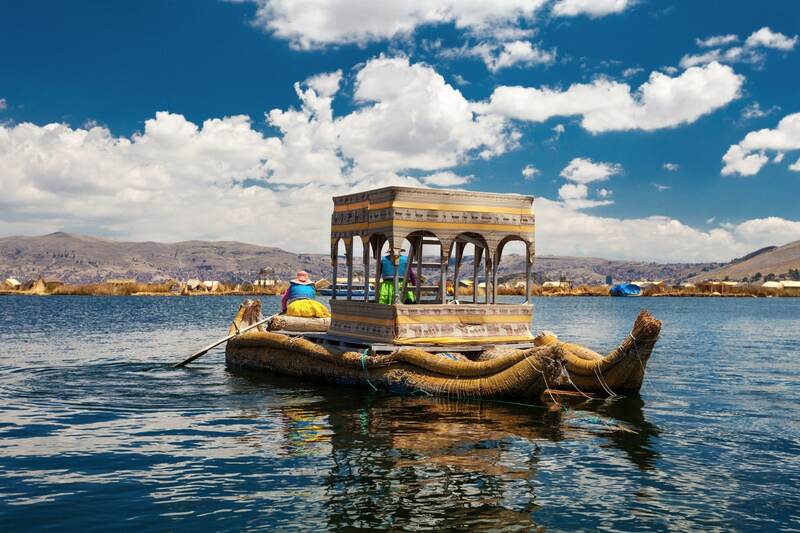 Take a boat ride to Puno. From here, you can take boat trips to the totora-reed islands, man-made islands built by the indigenous Uros using totora reeds. Then head back to Puno to see the sights; we recommend the beautiful Cathedral Basilica of St. Charles Borromeo. Puno to Cusco! 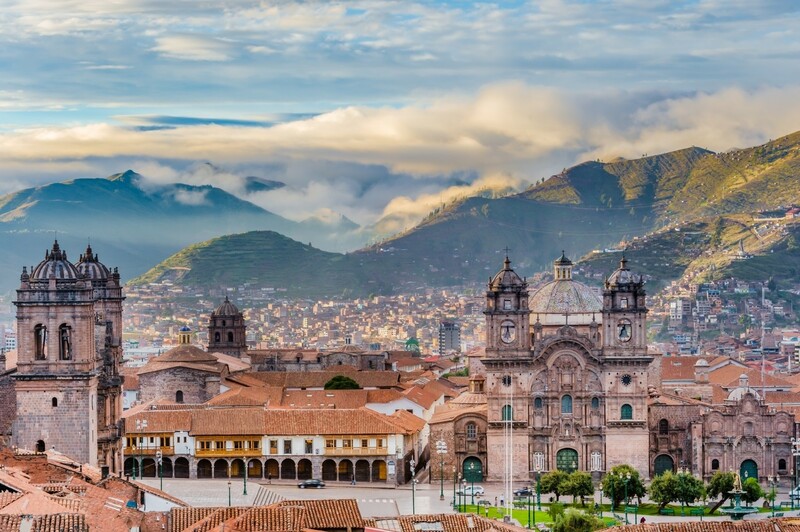 Known for its architecture and history, and named Inca’s ‘navel of the world’, Cusco is home to the region’s best hotels, along with exciting bars, restaurants and museums. We think that staying here for two nights is best, as there’s a lot to see. Check out our pick of the best things to do in Cusco. You will be picked up from your hotel early in the morning, and taken on a 3 hour trip to Kilometre 82, the start of the 4-day Inca Trail to Machu Picchu. Rated one of the 5 best treks in the world, this is a 100% must for your bucket list. The Inca Trail trek has to be booked well in advance – if you don’t nab a space, alternative treks such as Salkantay and Lares are worth looking into. If you don’t fancy those, explore more of Cusco and its surrounds before heading to Machu Picchu Pueblo (also called Aguas Calientes) to go directly to Machu Picchu. After having explored Machu Picchu, hike down to Aguas Calientes, where there are a number of hotels to wind down at for the night. Aguas Calientes isn’t the most relaxing of towns, so unless you have a burning desire to head out, take some time to decompress and relax after your strenuous hike. Take a train from Aguas Calientes to Poroy, marvelling at the Sacred Valley on the Vistadome Train or the more luxurious Hiram Bingham train. After a 25 minute transfer, you’re back in Cuzco. Fly to Lima. Take a whirlwind tour around Lima, the Peruvian capital. Stroll along the Malecon, visit the old town with its majestic cathedral and the striking Monasterio de San Francisco. Street art lovers should head to Barranco – the centrepoint of Lima’s street art scene. Don’t forget to try a few pisco sours and hunt out the best ceviche in Lima along the way. Destinations: Santiago, Atacama Desert, Bolivian Altiplano, Salar de Uyuni. Two weeks in South America is not enough time to see everything that the continent has to offer. This trip will take you to the very best of the continent’s incredible landscapes so you can decide on your own personal favourite. Make sure you have a trusty travel camera for this one… you’re going to need it. Arrive in Santiago, Chile’s capital city. Santiago rivals La Paz for its dramatic setting: it sits in a valley surrounded by mountains. It’s a cool city, with lots of options for sightseeing, restaurants, nightlife and lots of accommodation. If you have a bit more time, spend a couple of days exploring Santiago. Fly to Calama, and journey to San Pedro de Atacama, where you will lodge for the night. San Pedro is pretty tiny and congested (to be honest, it’s not our favourite place) but it makes a good base for exploring the Atacama Desert by taking tours. If you want a completely unique experience, hire a campervan from Wicked Campers Chile to explore the Atacama at your own pace. If you have the money, another (much pricier but also fabulous) alternative to staying in San Pedro is basing yourself in one of the high-end lodges dotted around the area such as Explora Atacama. Perfect if you’re looking for a touch of luxe for the trip. 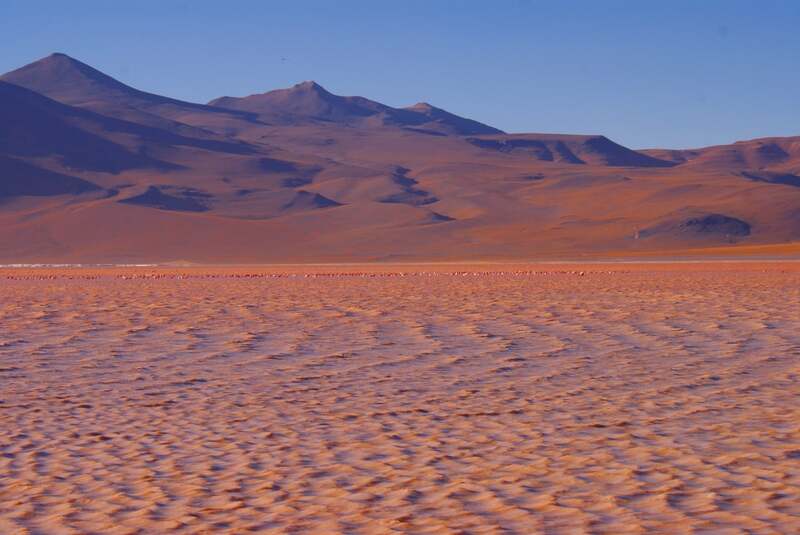 Spend a few days taking tours or driving yourself around the Atacama Desert. Be sure to see the highlights such as El Tatio Geyser Field and the Valle de la Luna. 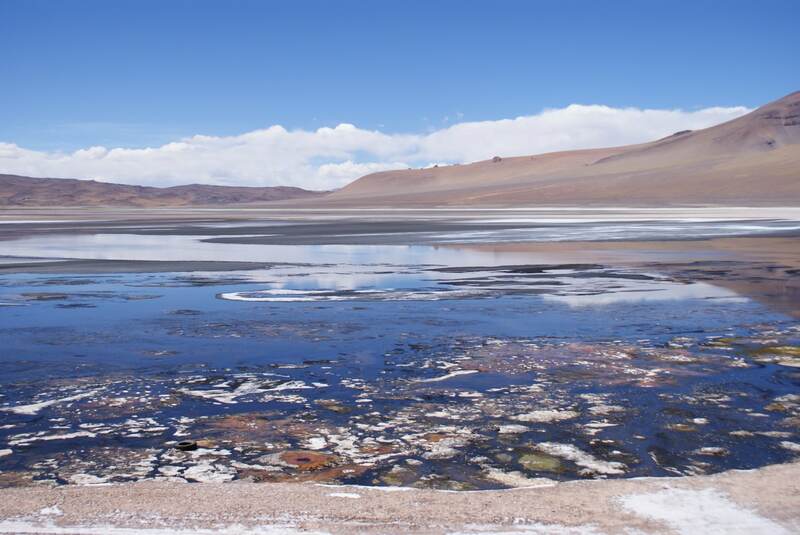 The Laguna Cejar, where you can float in the salt water, is another must-see. 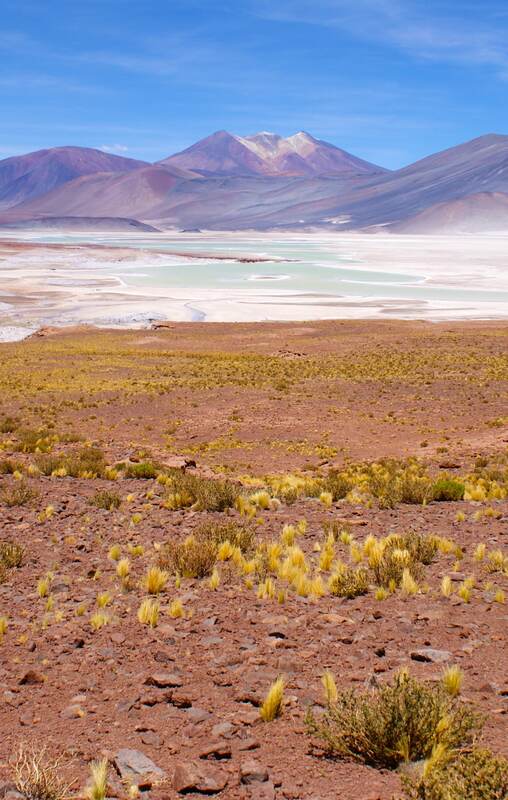 Get off the beaten track in the Atacama Desert and you’ll be well rewarded… High altitude lakes such as the Salar de Quisquiro and Salar de Capur look like they’re straight off of another planet. Don’t forget to bring your binoculars – the Atacama has some of the clearest night skies in the world and the stargazing is unrivalled. Hop over the border to Bolivia to the small Bolivian town of Tupiza to start a four-day adventure across the Bolivian Altiplano. Visitors tend to take tours along this route, though it is possible to drive a rental vehicle (this will need to be a 4×4 – the terrain is pretty rough). Either way, you’ll see thrilling Bolivian landscapes such as the Laguna Verde (Green Lake), the Quebrada de Palala and the surreal Laguna Colorada (Red Lake). 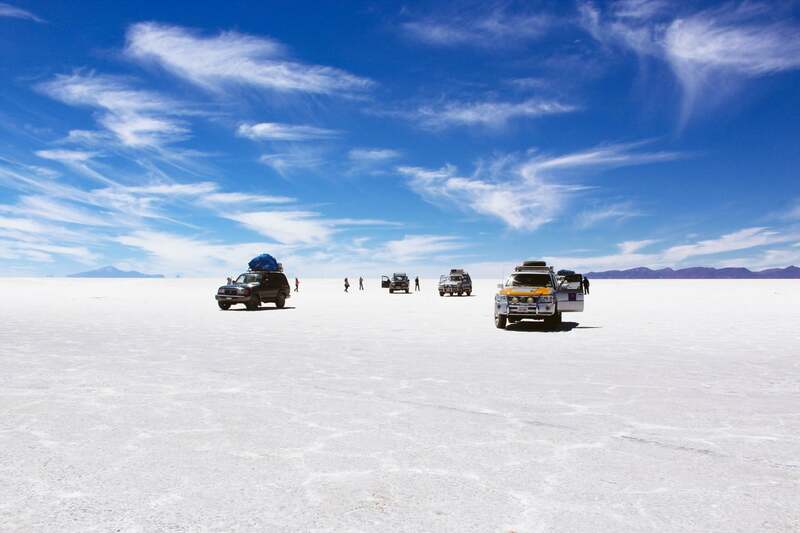 Carry on to explore the Salar to Uyuni (Bolivian Salt Flats), the world’s largest salt flat (a place we love so much, we’ve written a whole guide on it: how and when to visit the Bolivian salt flats). Having met with the locals at the village of San Cristobal, walk up the Valle de las Rocas, and see unparalleled views of the Ollagües Stratovolcano and the flamingo-lined Hediona shores. Spend the night at the luxurious Salt Palace, the world’s first salt hotel. Your two weeks in South America are almost over. The last day of this South America itinerary consists of walking along the never-ending salt-flats, and stopping at the Incahuasi Island to see the remains of the once-submerged volcano. You’ll return to Calama and then take a flight to Santiago for your journey home. 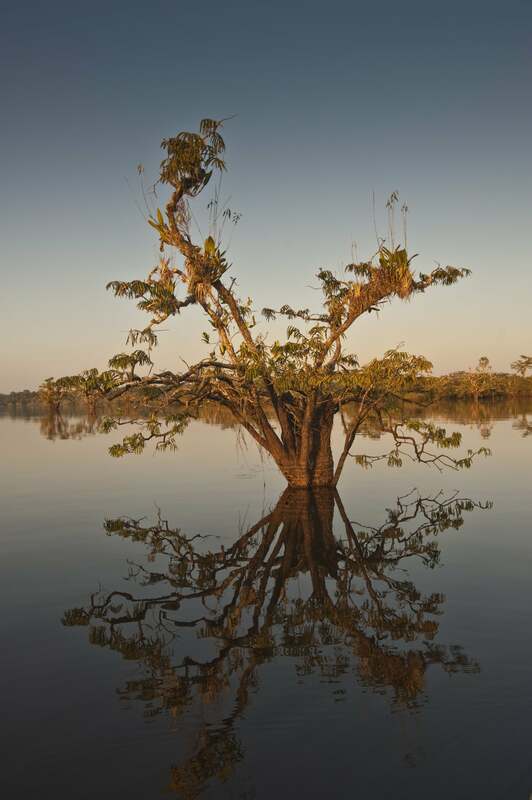 People visit the Amazon for the mosaic of different plants and wildlife that can’t be seen anywhere else. This two week South America itinerary gives you time to explore the world’s most famous rainforest and plenty of time to relax on slow boats as the time and the views pass by. Bring plenty of insect repellent, you’ll regret it if you don’t. Start in the opulent city of Manaus, the capital of the Amazonas state. The city was built at the height of the rubber boom at the end of the 19th century and is a testament to the riches the industry brought to the region at that time. Broad roads, spacious piazzas and the famous Teatro Amazonas opera house are just a few of the relics dating back to that time. Take a one day river trip to spot some wildlife and the meeting of the waters. 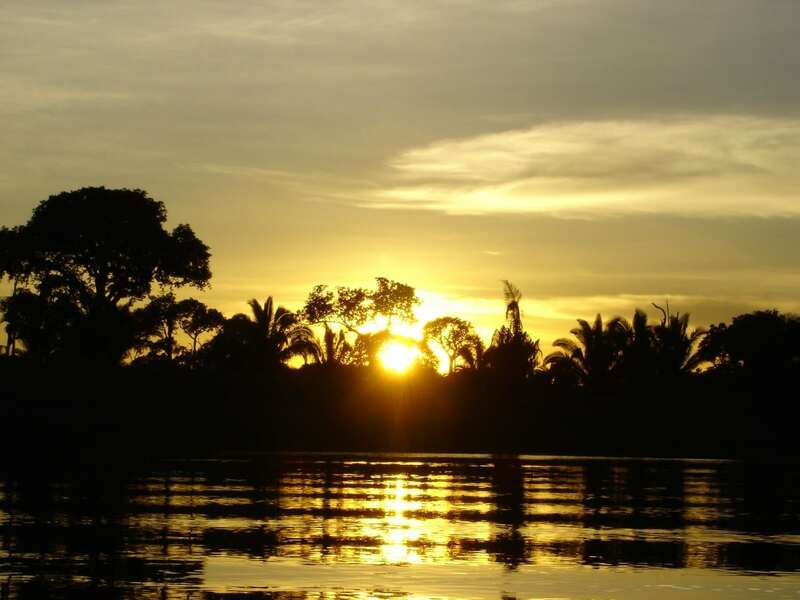 Book yourself onto the mammoth seven day journey up the Amazon river to Tabatinga at the Brazilian/ Colombian/ Peruvian border. You can either book to sleep in a hammock on deck, or reserve a private cabin. Take some time to relax, catch up on your travel reading and generally marvel as you float through the jungle. Boats from Manaus generally terminate at Tabatinga, a slightly shabby border town. Leticia is just over on the Colombian side and a better choice of base for the next few days. Take a jungle tour to the Parque Nacional Amacayacu where you can spy pink river dolphins and over 500 species of bird among many other things. We’d recommend spending the night in a hammock in the parque before returning to Leticia for your onward journey. Take a jungle tour to the Parque Nacional Amacayacu where you can spy pink river dolphins and over 500 species of bird among many other things. We’d recommend spending the night in a hammock in the parque before returning to Leticia for your onward journey. Time for the second slow boat, this time from Leticia to Iquitos in Peru. You could take a speedboat, which will do the journey in 12 hours – but where’s the fun in that? Instead, book a space on one of the barges that crawl their way along the Peruvian Amazon to the large city of Iquitos. Disembark at Iquitos, another city that benefitted hugely from the late 19th century rubber boom. Check out the elegant architecture and intricate decor in buildings such as The Casa de Fierro, Iglesia Matriz and Casa Khan. Decompress in one of the laid-back bars and savour the excellent local cuisine before heading home. 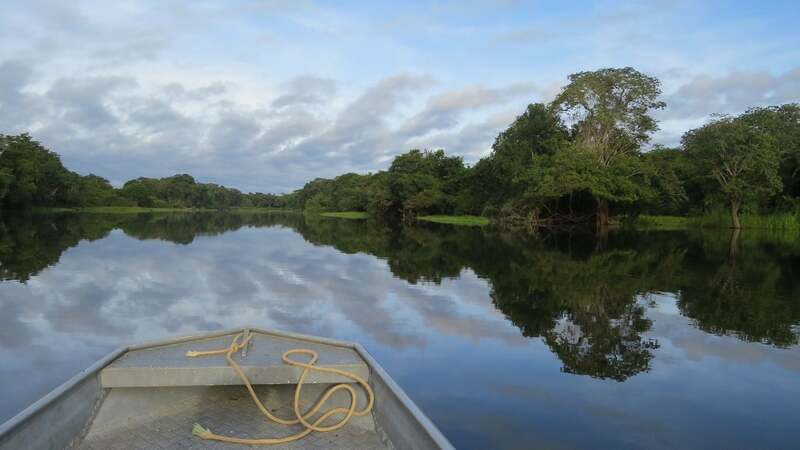 You can also explore the Ecuadorian Amazon – read one traveller’s account of his Ecuador Amazon tour. Calling all beach lovers! You think you’ve seen it all? Well, you’re in for a big shock. Just wait until you see the beautiful beaches of Brazil. You’ll spend two weeks in South America, exploring the best beaches in a country that certainly isn’t lacking in sandy spots to flop and drop. Arrive in Santos, Southern Brazil, home to Brazil’s biggest port. Spend your first night in Guarujá, a coastal town near São Paolo. Best beach: Iporanga Beach, 25km from the city centre. Travel up to the BR101 by car, and take a ferry to the island of Ilhabela, where you’ll spend the night. Portuguese for ‘beautiful island’, Ilhabela is a city 4km off the coast. 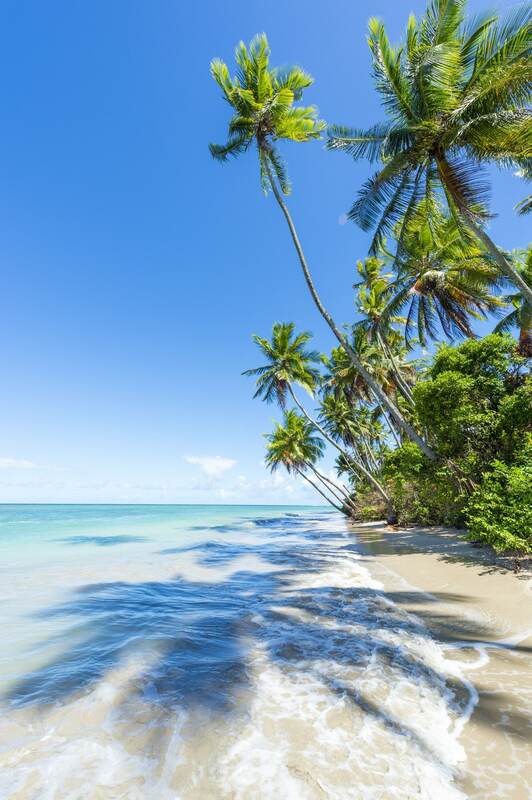 It boasts the perfect combination of untouched tropical jungle (protected by UNESCO) and pristine beaches where the young and beautiful are known to party. Best beach: Bonete. Take the ferry back, and drive up to Ubatuba, where the road climbs up through the mountains of the Serra do Mar to Catuçuba. Relax at the local ranch, and even horse-ride in the hills if you fancy. Before it gets dark, carry on your drive to Paraty, where you’ll stay 2 nights. Paraty is Southern Brazil’s most picturesque city, with a quaint colonial centre combined with beautiful beaches. The hotels and dining are also terrific. Best beaches: Lula beach and Vermelha beach. 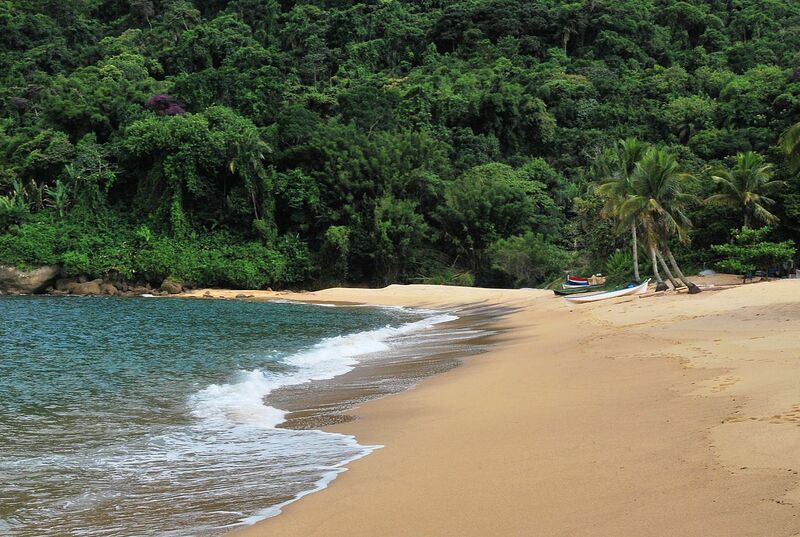 Drive to Angra dos Reis, and catch a ferry to Ilha Grande, a lush green island full of beautiful beaches and forests. Beach hop or hike around the island; we love Parrot Peak, a hike in the forest that leads to the top of a parrot-shaped rock formation – it’s tough but well worth it for the views. Best beach: Lopes Mendes. Make your way to Rio de Janeiro. 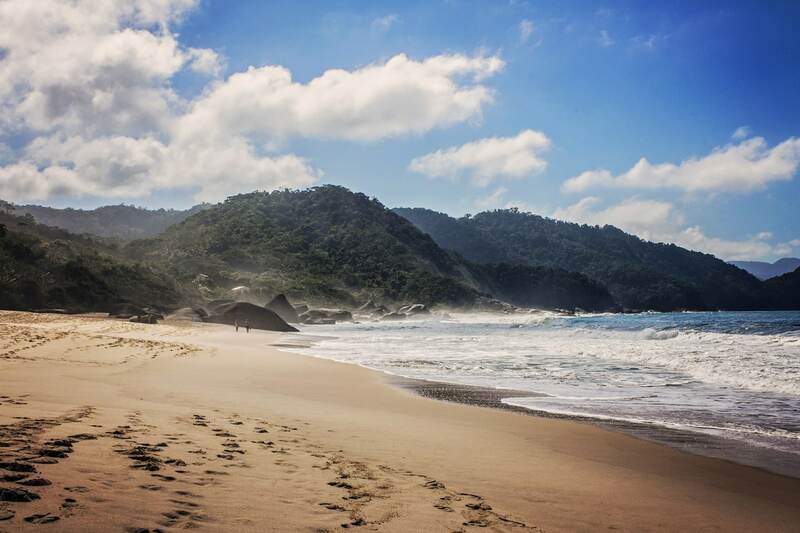 Having arrived in Rio, head to the stunning beaches on its coast. Our favourites are Copacabana, the true city beach, and Ipanema. We recommend spending 2 nights in Rio to visit both of these beaches and explore the rest of the city. 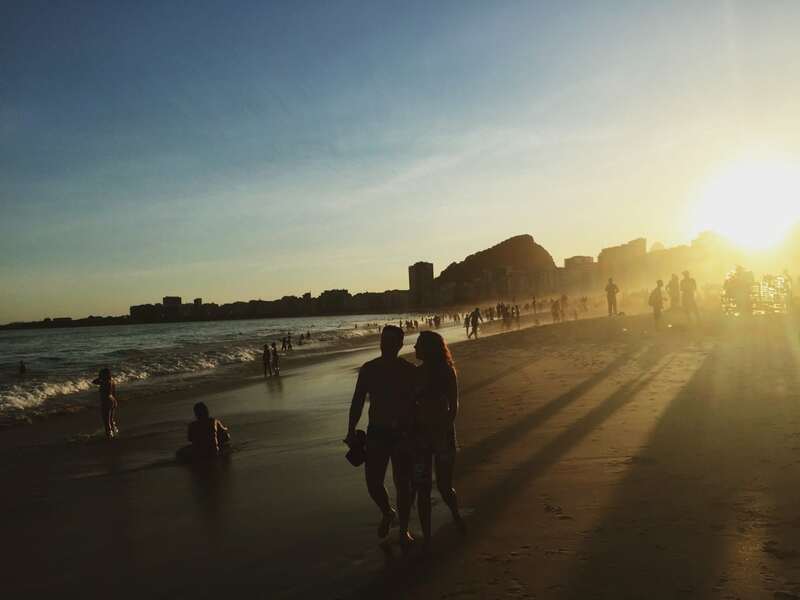 For something a little different, the stunning beaches of the Barra da Tijuca neighbourhood wind their way along miles and miles of coastline, fringed with some of the city’s most upmarket bars and restaurants. If you want to get out of the city, head to Buzios, a Riviera-esque beach only a day trip from Rio, which has been famed for its St Tropez chic ever since a bikini-clad Brigitte Bardot visited here in 1964. Catch a flight to Salvador, and spend a day exploring Bahia’s vibrant and exciting capital. While Salvador’s beaches aren’t the best in Bahia, take the two hour boat ride to the island of Morro de Sao Paulo for a slice of the beach life. The island’s enchanting beaches and laid back attitude captures the heart of many a traveller – we wouldn’t blame you if you spent an extra few days here. Return to Salvador and fly up to Recife, further north. 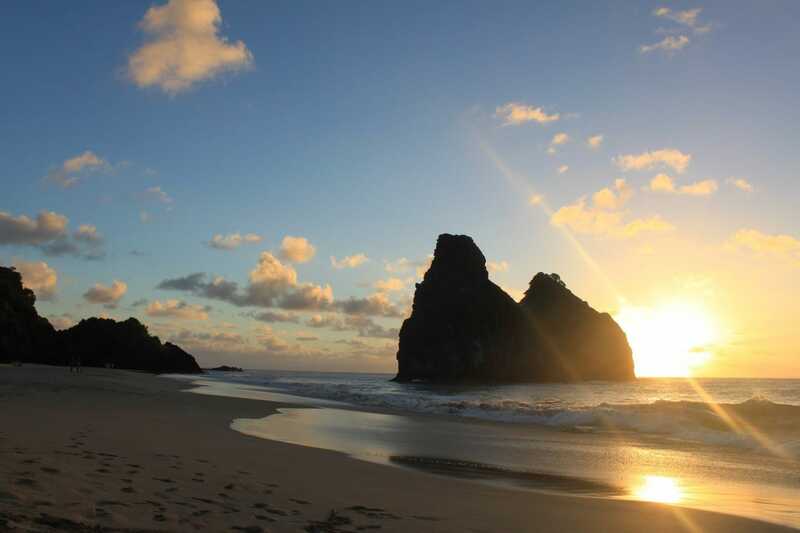 From Recife, take a flight to Fernando de Noronha, a small island archipelago that’s often named as home to Brazil’s best beaches. If you’re feeling active, take some time to explore the rich underwater life surrounding the islands – the diving is first class. Return to Recife. If you have a few extra days, make your way to the UNESCO Heritage town of Olinda, one of the prettiest in the country. Otherwise, it’s time to go home. 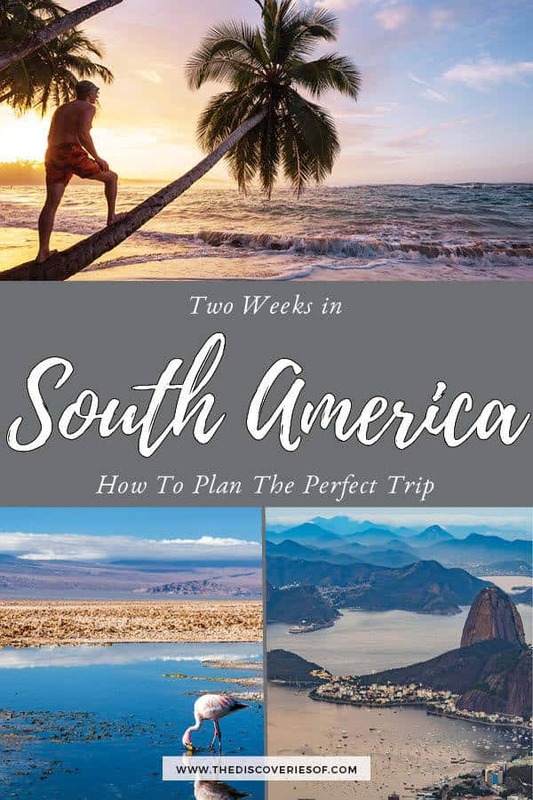 Which is your favourite 2 week South America itinerary? 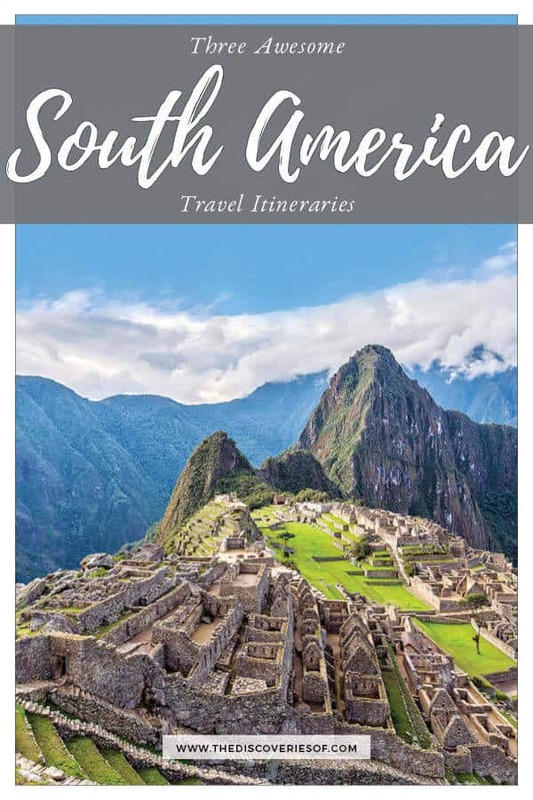 Amazing itineraries for South America. I still haven’t been anywhere yet in SA so this will be super helpful when I finally get there! I think the Patagonia trip may be towards the top of my list! Thanks for taking the time to write these. Thanks Mike. Just can’t get enough of South America – you’ll be totally blown away by Patagonia. Always happy to help with tips and advice! I have only visited Chile on the list but I absolutely fell in love and I can’t wait to visit the other countries on your list. What was your favorite? I think it’s a close call between Chile and Argentina. The hiking and sceneries in both are just astounding! Thanks for the awesome tips and plans, your photos are amazing! So glad we’ve helped inspire your travels! Totally should go! Please do – always more than happy to help! Omg your pictures are ridiculous! Need to go to this part of the world. Saving this post for later as reference! Hate to pick favourites but it’s totally my favourite travel destination overall. Enjoy if you do go! These pictures are giving me some serious wanderlust! I’ve never been to South America but some of these places have been on my radar for ages e.g. Patagonia. Loved these sample itineraries, great post! Thank you so much Helena – hope you find them useful when you do go! Thanks Melissa – you are going to have such a great time – I’ve been so many times and can’t stop going back. Shout up if you have any questions or need tips – plus we’ve written loads of South America articles too. Great post! I love how you have group different areas according to specific interests. South America is such and vast and rich continent that sometimes it’s hard to choose where to go first. In my case, I still have not been to the Amazon; so that would definitely be my next adventure. Thanks – I’ve always found it really difficult to pick where to go on shorter trips so thought doing it that way would help people out! Always more adventures to have. Great article,I love it.Thanks for sharing this article with us. Really glad you enjoyed it – hope that you find it useful. Thank you, Julianna! My husband and I would love to visit Patagonia, Machu Picchu, and have a couple of beach and historic city days. I’d love your thoughts to see if that could be doable in 2.5 weeks, while still being relaxing? Hi Kate – really glad that you liked the article. You’re going to have such a great time! I would say that 2.5 weeks is going to be relatively tight to head to Patagonia, Machu Picchu, explore both and still have time to head to the beach (are you thinking a beach in Chile/ Peru?) and any city other than Cusco. You can do it if you take flights, but I don’t think that it will be that relaxing. Perhaps you could spend a week and a half exploring Patagonia, fly up to Cusco and spend a few days there before going to Machu Picchu on the train (spending a night in Machu Pichu Pueblo)? I’m actually starting to do one-off custom itineraries for South America – drop me an email on julianna@thediscoveriesof.com if you’re interested. I read your 2 week itinerary article and loved so many of your suggestions. You had mentioned that you are now doing one-off for a custom plan. I would be interested in this! My son will be in Buenos Aires attending school and I plan to meet him on July 10th. We will then travel for the next 2 1/2 weeks. I have been studying our options but honestly on overload with all the choices and the distances. I am really what to make the most of out time. We love nature, hiking, kayaking, beaching, adventure and sight seeing. For sure…. 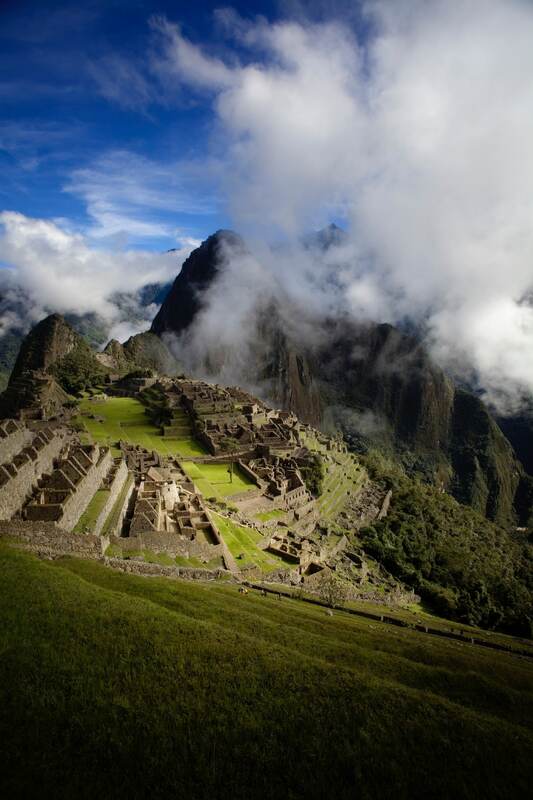 I would like to include Machu Picchu and the Galapagos….and possibly the Iguarza falls. Please let me know if you are available? Where are you located? I am in Dallas Texas. Thanks for getting in touch – very glad to hear that you found the itineraries useful. Unfortunately, I’m no longer doing custom South America itineraries but here are a few tips to help you along the way. 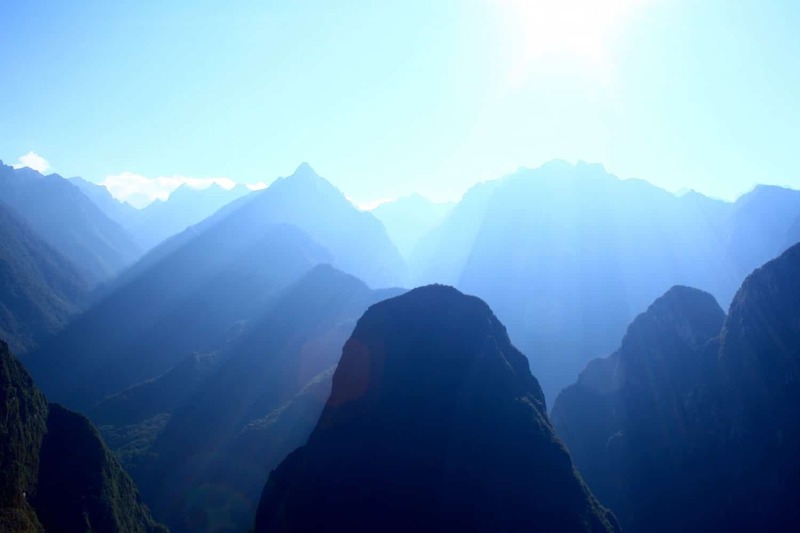 I think most importantly, you want to focus on a few destinations that preferably are quite easy to travel between – the distances are far and even when you fly, it can take a lot of transit time getting from a to b (Machu Picchu being the perfect example). I’d say if you go to Machu Picchu and the Galapagos you will probably have to skip Iguazu and instead focus on Peru/ Ecuador. The first time I travelled in South America, I tried to cram way too much into a short period and ended up spending a lot of time in transit – I’d always recommend going to fewer places and seeing more in each of them. I hope that you have a wonderful trip. In 2011 I visited Colombia with my two children. We enjoyed visiting the Caribbean coastline and old town of Cartagena. Then in 2012 we went back to South America for a longer trip. We had time in Argentina, Chile, Brazil and Uruguay. One of the best things was seeing the tropical birds. So glad to hear it Maxine – there’s so much biodiversity across the continent – absolutely incredible to see.